The shovel was a big investment at the time and I have been ‘invested’ in it ever since. It’s good for digging any manner of material and it digs deep. Initially, I thought it would be helpful when we were digging the trench for the gas line from the house to the studio. It’s a strange thing that it’s sitting inside the front entrance. The white blotch is a patch job. When he was young, Max ate through my wall. He was upset that there was construction happening next door and so decided to fight his way through the wall, to the source of the noise. I wonder how long it will be before I prime and paint. 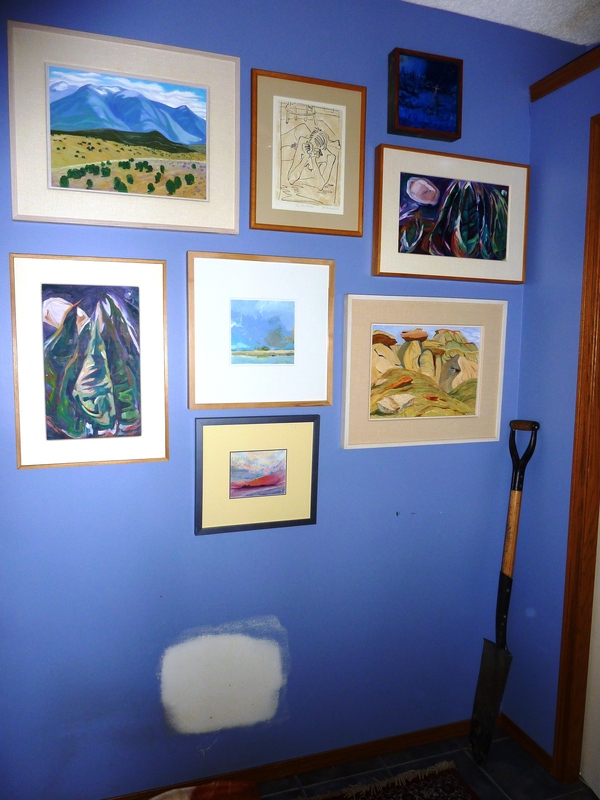 I wonder that any time I see a photo of that wall…usually the photos that I take after Thanksgiving and Christmas feasts as I’m saying goodnight to my guests. Laurel Cormack’s figurative piece was taken from a handmade calendar that I once purchased. I still consider Laurel to be a mentor after all of these years and so it makes sense that such a wonderful and whimsical piece find its place at my entrance. I began to paint again, after years of discouragement, while taking an extension class with Laurie at ACAD. I loved that we went outdoors to paint and still remember sitting, in the golden rod, looking across to Mount Yumnuska. There are two pieces here from another great Canadian female painter, the one in the top left and the one in the bottom right….Doris McCarthy. I read her book, Fool in Paradise: An Artist’s Early Life when I turned 40. At the same time, I held her hand at the CAG in Calgary and she shared the urgency behind painting every day. One of these is a painting titled The Spotted World of New Mexico and the other is a Hoodoo panel painted at the time of the filming of The Heart of a Painter by Wendy Wacko. The wee central piece is by artist, Jim Stokes. I’ve got to say that I purchased this piece because I am and always will be so in love with the vast sky that is ours in western Canada. I admire Jim’s work because he captures the fluidity and the transparency of that sky. I could only dream of owning one of Jim’s large canvases. The two nocturnes were studies that I completed once on a ten-day horse packing trip up the Sheep River, through the Blue Rock. From that trip, I painted the exhibit, Kindred Spirits. I enjoyed spirited time around the campfire with the likes of Ken Christopher, Alex Cameron, David Alexander. I painted these nocturnes early morning after too much Johnny Walker. The painting on the top right is a small acrylic piece done by my friend, Bobby Melville. This painting captures a woman dancing in the light of a full moon. I think it’s an exceptional little piece for its inherent statement about the ‘goddess’ and the power of the moon to influence the tides. On the very bottom is a small watercolour that I purchased from another friend-artist, Lorelie Haydt, while attending one of those wonderful community art exhibits. The painting, I remember her sharing, represents a time in her process where she felt an unleashing and a freedom in her work. As an artist, I can relate to the magic of that experience. In this lifetime, I feel no huge attachment to the objects that surround me, but I enjoy them for the stories/memories that they evoke, knowing full-well that they are ephemeral…all is ephemeral.